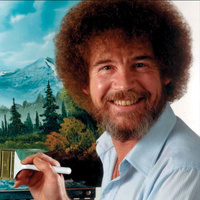 This talk focuses on Bob Ross, the public television impresario of The Joy of Painting, an internationally syndicated program begun in 1983 that spawned a cottage industry of how-to books, videos, and licensed Bob Ross art supplies. Ross is best known for instructing audiences of amateurs in how to complete an oil on canvas original, otherwise unaided, at home. In his program he conjured, through the expedient technique of painting wet on wet, a sylvan retreat or mountain pass, thus demystifying the process of creation while encouraging a comparable instantiation of subjectivity on the part of his viewers — most of whom remained precisely that, with few actually taking up the brush. The lesson was not the communication of the skills to execute the painting itself but the virtue of the staging and witnessing of making as a cultural good. In turn, this addresses a longer history of non-artists making art in America: a history that suggests — as Ross understood — art’s utility may be predicated upon its therapeutic basis. The second talk in the HAA Lecture Series 2017-2018, The Senses, will be “Happy Accidents” by Suzanne Hudson, Associate Professor of Art History and Fine Arts at USC.